An otherwise run-of-the-mill sit/com (debuted in 2010) which is saved by the incandescent and downright hilarious inclusion of the amazingly wonderful Betty White. She MAKES the show. Do you get the idea that I love Betty White? I hope so. Because I do. Typically, the show makes little sense. It features three slightly over the hill (but fabulous) women, Wendy Malick (whom I adore) Valerie Bertinelli (whom I like very much) and Jane Leeves (whom I like well enough) who play best friends. The casting is really not far behind Betty in talent and likability. The premise is that while women of a 'certain age' go under appreciated and overlooked in Hollywood, land of the young, in Cleveland, these women are still considered 'babes'. Wendy Malick, Valerie Bertinelli, Jane Leeves and Betty White. In the first few episodes I saw, the writing was not especially great and the plots seem a bit forced, but all I have to say is: Betty White, Betty White, Betty White. She steals everything that isn't nailed down. She plays a salty landlord, whose house the three Hollywood 'babes' are renting while in Cleveland. They've landed there by misadventure when their plane to Paris has an unexpected mishap. All three women are bowled over by the attention the local males lavish on them, so they decide to stay in Cleveland for awhile. I mean, wouldn't you? Anyway, of course they wind up with a charming house, fully furnished, and Betty White (who lives in the caretaker's cottage on the property) as the adorable landlord who is always around, ready with a quip or a stinger guaranteed to make you laugh. At 90, Betty White is just as funny as she's ever been, her line delivery is perfection. The woman is unstoppable, not to mention, irresistible. As I said, she makes the show for me, though I do like the rest of the cast which also includes the wonderful Carl Reiner as Betty's occasional boyfriend. 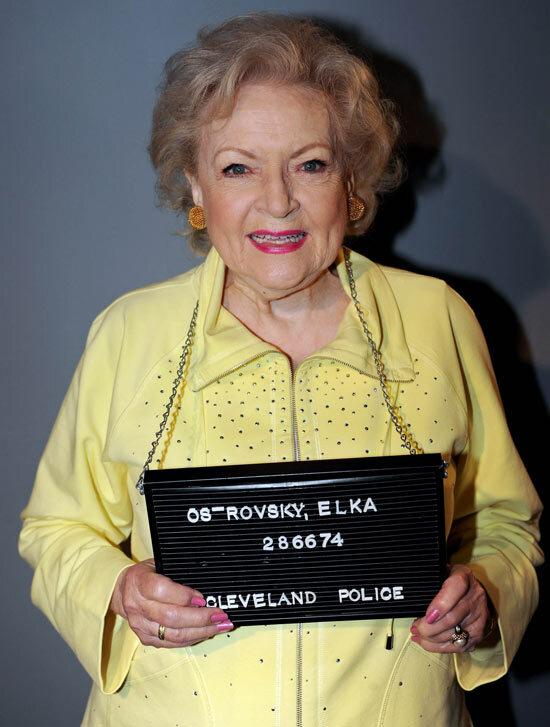 Betty White's perp pix when she is arrested for...well, you'll have to see the show. I howled with laughter as she poses for her mug shots. I've watched a few of the episodes one after the other (which is perhaps not the best way to watch comedy) on Netflix, and intend to watch more. Though recently I realized that the shows on Netflix appear to be out of order. No wonder I had trouble following the concept. The series was created by Suzanne Martin (Frasier, Ellen) and has been renewed for a fourth season on TV Land. So, there's plenty left for me to watch. To get the full low-down on HOT IN CLEVELAND, please use this link to the show's website. I've watched one or two of these but it seemed to much like GOLDEN GIRLS. I've missed this show, but I do adore Betty White! I watch this show and I like it, and agree with your assessments of each actor. It's an excellent cast. Betty White does steal every scene. My only problem is that I don't remember when it's on, but I'll doggedly look at the TV schedule and try to watch at the right time. I like Wendy Malick, as well as Betty White and Jane Leeves. Valerie Bertinelli is okay. I watched the first season and gave up on it. I was the same way with the Fran Drescher show. Pat, if you love Betty White, then try to get a few episodes to watch. Anything that makes me laugh out loud these days is okay by me. When I used to have cable I never could remember when anything was on. I hate that the scheduling on TV is so hit or miss. Remember the good old days when a show was on one specific night at one specific time and none of this other horsing around? Now it's all so confusing. But since I no longer have cable, I can watch whatever either on Netflix, or youtube or even Hulu - though I'm not crazy about the fact that Hulu has commercials. I can even watch full episodes of Mystery or whatever on PBS. Ryan: I used to watch Fran's nanny show, but never did get to see the other one. Could never figure out when it was on. The usual. She's wonderful. I can't believe she doesnt, currently, have a show on the air.